In eastern deciduous forests, low-intensity understory fires, canopy gaps, and ungulate browsing are generally regarded as the main forces influencing vegetation dynamics. Over the past 100 years, all three of these historic disturbance and herbivory regimes have been altered to some extent (e.g., fire suppression, smaller, less frequent gap formation in 2nd growth forests, and overabundant deer herds) and have been putatively linked to observed changes in regeneration patterns and losses in understory herbaceous diversity. Although all three processes are common and often co-occur, the vast majority of studies examine their impacts in isolation and only a select few examine potential 2-way interactions. This is unfortunate as interactions among all three forces are likely the norm, rather than the exception, in forest communities. The major objective of this research program is to elucidate how mammalian herbivory, understory fires, and canopy gaps influence the richness and abundance of plant species in forest understories. As all three processes often co-occur, we simultaneously manipulated the presence/absence of canopy gaps, fires, and deer browsing in a fully-factorial manner in order to understand how these factors operate alone and in concert. From an applied perspective, understanding the strength and directions of these effects and potential interactions is critical as many silvicultural practices currently utilized within the region are predicated on simultaneous manipulations of two or more of these factors (e.g., Shelterwood-Fence technique; Shelterwood-Burn technique). 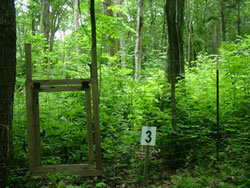 This study is being conducted on two parallel sites in mixed-oak forests of West Virginia. The first site is the WestVaCo Wildlife and Ecosystem Research Forest and the second is located in the Fernow Experimental Forest (Monongehela National Forest). The first site was initiated in 1998 and the second in 2000. Periodic measurements of growth and mortality of tree seedlings as well as the diversity of the herbaceous plant community will continue to be collected on this unique experiment. The data collected at these sites is being used to evaluate how interactions between disturbance and herbivory alter plant abundance, growth, and composition. We expect our work to provide an expanded knowledge of disturbance effects to managers who wish to better balance timber-related goals with overall biodiversity goals. Royo, A. A., R. Collins, M. B. Adams, C. Kirschbaum, and W. P. Carson. 2009. Pervasive interactions between ungulate browsers and disturbance regimes promote temperate forest herbaceous diversity. Ecology in press. Collins, R. J. 2004. The effects of prescribed fires, canopy gaps, and deer herbivory on tree species composition: Implications for succession theory. Ph.D. Dissertation, University of Pittsburgh, Pittsburgh. Collins, R. J. and W. P. Carson. 2003. The fire and oak hypothesis: incorporating the effects of deer browsing and canopy gaps. Pages 44-63 in Thirteenth Central Hardwood Forest Conference. USDA Forest Service General Technical Report NC-234.